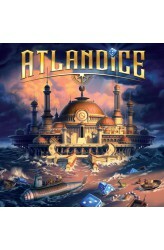 In one day and night, the island of Atlantis has been overwhelmed beneath the sea. The greater city of Atlantis is about to sink. You, as the last Atlanteans, have to save as much wealth as possible before you flee the fury of the elements. The clock in the center of the city shows the remaining time before the end. But because of the cataclysm, the gates between the locations are broken down. They open and close randomly. Collecting goods will not be so easy... The mechanisms in Atlandice are unique, but simple. On their turn, a player chooses one of the available dice, which is, in fact, a gate. This gate brings the player to a location; in this location are randomly distributed resources and effects. 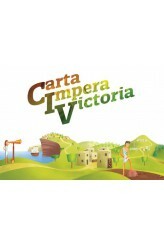 The effects are randomly dispatched with tiles at the beginning of th..
CIV: Carta Impera Victoria is a game of CIVilization and diplomacy in which you develop your own civilization. Be the first to reach supremacy in one field to make history, but keep an eye on how your opponents are advancing. Forming a temporary alliance might be the best way to keep a player from triumphing…and remember that offense is sometimes the best defense! In more detail, a player wins when they reach supremacy in a field; if this doesn't happen, when no more cards can be drawn, the game ends and players go through a majority scoring to determine the winner. CIV includes six fields of competition: Army, Religion, Economics, Science, Culture, and Utopia. The 104 cards in the game are split in three ages, which represent the natural evolution of global civilizati..
On the 11th of July, 1899 at 10 a.m., the Union Pacific Express has left Folsom, New Mexico, with 47 passengers on board. After a few minutes, gunfire and hurrying footsteps on the roof can be heard. Heavily armed bandits have come to rob honest citizens of their wallets and jewels. Will they succeed in stealing the suitcase holding the Nice Valley Coal Company's weekly pay, despite it having been placed under the supervision of Marshal Samuel Ford? Will these bandits hinder one another more than the Marshal since only the richest one of them can come out on top? 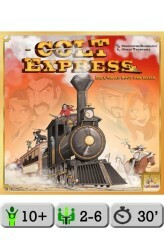 In Colt Express, you play a bandit robbing a train at the same time as other bandits, and your goal is to become the richest outlaw of the Old West. The game consists of five rounds, and each round has two phases: P.. 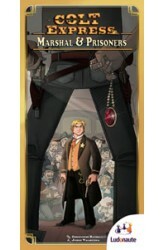 The Colt Express: Marshal & Prisoners expansion contains three new components: It adds another character "Mei", a martial arts lady. The players can free prisoners from the prison wagon that is added to the end of the train. One player can play as the marshal, who has two decks of bullet cards and three specific items. The Marshal has got four hidden and random objectives, he must achieve it to win the game (i.e. shoot every bullet from one gun, catch a Bandit, Shoot at every Bandit, ...) Freeing junior bandits from the prison car gains their help (i.e. 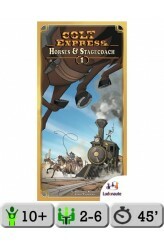 a secondary ability for your character) ..
Colt Express: Horses & Stagecoach, the first expansion for the 2015 Spiel des Jahres winner Colt Express, introduces a 3D stagecoach that rides alongside the train from the base game. The bandits now have horses that they can ride to move faster between the cars, and these horses allow them to jump into the stagecoach as well. The stagecoach is protected by a guard with a shotgun, but a punch in his face would be enough to eject him toward the roof of the train. From there, though, he will annoy the bandits on the roof. Once the stagecoach is free of the guard, the bandits can collect a new strongbox. Inside the stagecoach, they will also find some hostages who will be worth a ransom at game's end. Careful though, as each hostage has a negative effect that will annoy the bandit .. The Lewis and Clark Expedition, which was commissioned in 1803 and ended in 1806, was the first party of men that went through the North American continent, then returned. During these three years, the leaders Meriwether Lewis and William Clark, along with Sergeant Gass and Sergeant Ordway, wrote page after page about their trip, describing the new plants and animals species they discovered and drawing the maps of unknown areas. In Discoveries, you play one of the Expedition members: Lewis, Clark, Gass or Ordway. Your goal is to compile as much knowledge as possible in your journal, and in this way advance science thanks to your discoveries. The Tribe/Discoveries cards you gain during the game score discovery points at the end. To get these cards, you have to perform exploration..
On November 30, 1803, the United States purchased Louisiana from Napoleon. U.S. President Thomas Jefferson decided to send two explorers – Meriwether Lewis and William Clark – to discover this huge terra incognita. 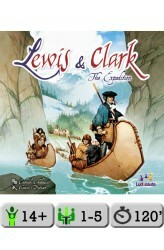 Lewis & Clark is a board game in which the players manage an expedition intended to cross the North American continent. Their goal is to be the first to reach the Pacific. Each one has his own Corps of Discovery that will be completed by the Native Americans and the trappers met during the journey. He has to cleverly manage his characters and also the resources he finds along the way. Beware, sometimes frugality is better than abundance. Lewis & Clark features dual use cards. To be activated, one card must be combined with another one, which becomes unavailabl..
Our intrepid adventurers have sailed on a journey, finding the hidden cave of a mythic monster. There are so many strange things there! The Captain allows the crew to search through the place and bring back to him what they have found, but by bluffing the Captain, they will try to keep the best part of the loot for themselves... 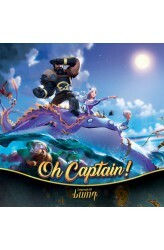 In Oh Captain!, an asymmetric game of changing roles, an adventurer must offer the loot cards they draw to the Captain, telling the Captain something about what the cards contain but not necessarily speaking truthfully. Indeed, some cursed objects can't be spoken of at all by the adventurers. The Captain, who is safe from being attacked by objects, decides whether the crew member can keep the loot or not, and if the Captain turns down the offer, the..